Huawei sub-brand Honor is launching its next 2018 flagship Honor 10 on April 19 in China. A few teasers and banners revealed the upcoming smartphone in its Twilight colour glory. Now, a fresh image of the rear panel shared on Weibo hints Honor 10 could be the first Honor smartphone to feature Leica branded dual cameras. 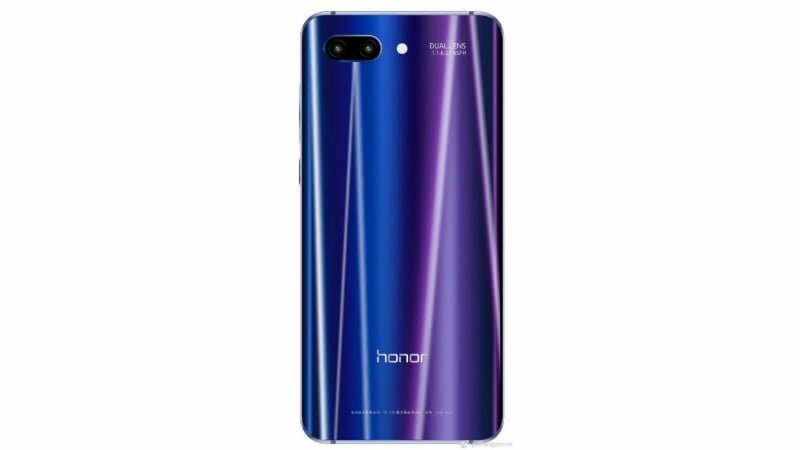 The device is seen sporting a colour gradient finish of blueish purple, which is different from the Twilight colour option of Huawei P20. The Honor 10 has horizontally arranged dual sensors along with a LED flash to the right of the camera module. Far on the right corner is the text “Dual Lens 1:1.6/27 ASPH” which hints the presence of Leica branded camera sensors. This is because the Leica branded Huawei Mate 10 cameras carried a similar text “SUMMILUX-H 1:1.6/27 ASPH cameras”. The rear panel of Honor 10 also seems to be made out of 3D glass, and of course, it will sport a metallic frame. The volume rocker and power key are present on the left edge as you can see in the image. The model number COL-AL10 can be seen at the bottom of the phone. Interestingly, the Honor 10 rear panel doesn’t house the fingerprint scanner. This has led to speculations of the under-display fingerprint scanner. However, the phone is more likely to come with a frontal home button embedded fingerprint scanner. As for specifications, the Honor 10 is rumoured to include the powerful Kirin 970 chipset, the same used in P20 handsets. The device will be offered in 4GB/6GB RAM variants along with 64GB/128GB onboard storage. The Honor 10 is also expected to join the ‘notch’ bandwagon this time, featuring a 5.8-inch FHD+ notched screen bezel-less display. As for optics, the device will be carrying the 12MP + 20MP dual primary camera and 20MP selfie camera. The camera is also getting AI integration support for improving image quality. Other rumoured features include IP67 certification against dust and water resistance. The phone will also be likely to be running on Android 8.1 Oreo OS out-of-the-box with the company’s own EMUI 8 running on the top. Of course, these are mere rumours and nothing of this sort can be confirmed. We can expect to hear more accurate specifications of the phone when it shows up in China later this week.